For years the Twins have played in the Dome, and let me tell you, Domes are no place for baseball games. It is too loud to hold a conversation with the person sitting next to you and baseball should just be played outside. 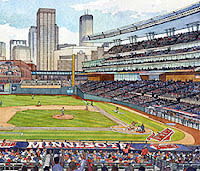 I probably won’t be attending a game until the ballpark is complete which is estimated for opening season 2010. Check out the webcam of the site during construction.